The BOXER driver training vehicle permits a high level of quality and safety of driver training for all BOXER vehicles. The driver training vehicle consists of a standard Drive Module and the Driver Training Module. Weight and ride behaviour match the characteristics of the Armoured Personnel Carrier. The vehicle is operated by a 5-men crew, with the driver sitting in the driver’s station in the Drive Module. The instructor and one crew member (possibly the driving test examiner) are seated in an elevated position in the driver training cabin. Two other crew members are accommodated in the rear of the Driver Training Module. Active occupant protection is an entirely new feature designed to protect the crew sitting exposed in the driver training cabin. In the event of a roll-over accident, the instructor and upper occupant seats are electronically sensed and are then retracted into the Driver Training Module in a controlled manner. The instructor can monitor the trainee driver via a duplicated control and display unit and override gear selector, brake and accelerator pedal of the driver’s station. Steering override is available as an option. The electrical cabin equipment, such as windscreen wiper/washer, windscreen heating, seat heating, etc. 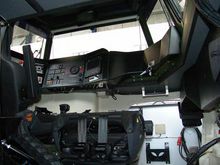 is operated via a digital control unit.The large glazed cabin, the mirror and camera systems afford the instructor a sufficient field of view, including the immediate surroundings of the vehicle. An additional air conditioner provides cooling for the cabin crew at high ambient temperatures.